Unplanned project changes are necessary in every project. However, some changes are great, but others aren’t. By formally submitting a change request for each change that comes up in a project, you can make them much more manageable. Filter out the bad ideas, embrace the good ones, but keep all of them organized. Change request forms are the primary project management tool used for requesting any changes to a specific project and are one piece of the change management process. 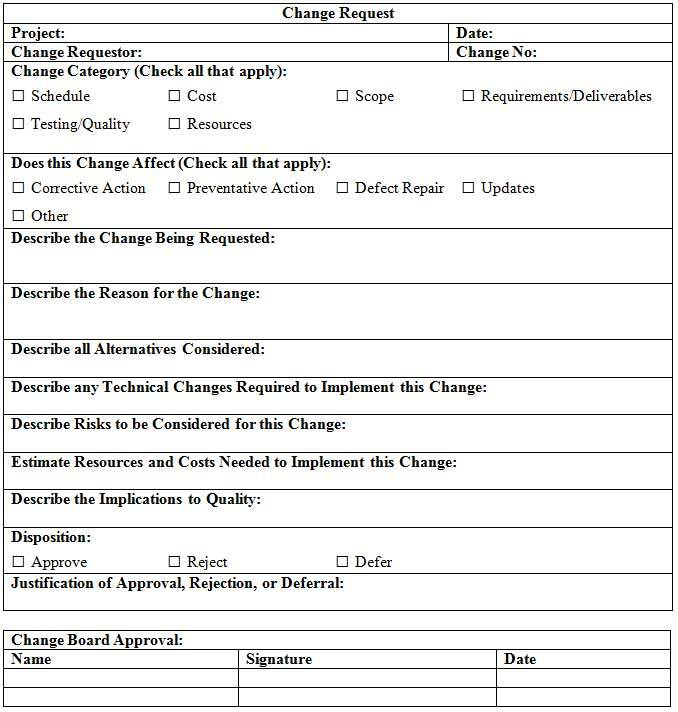 This change request template provides a good foundation for managing change requests on your project. All project managers must manage change carefully and implement a thorough change control process to ensure project’s remain within their approved constraints. Some projects have many stakeholders with varying levels of interest in the project and change is an inevitable part of any project lifecycle. The change request form is filled out by the individual who identifies the need for a change and submitted to the project team in accordance with the change control process. The project manager then leads the team in identifying the impacts of the change, whether or not it will benefit the project, and if it will allow the project to proceed within its approved constraints. The request is then submitted to the change control board with the project team’s findings where it is reviewed and either approved, rejected, or deferred until clarification can be sought. If the change is approved, all project documentation must be updated accordingly and the change must be communicated to all stakeholders. Some changes may also require re-baselining of the costs, schedule, or scope. There are many formats for change requests depending on the organization. The change request template below is one example of a thorough change request form.